Saltaire takes its name from its founder, Sir Titus Salt (1803-1876), and the River Aire, which runs through the village. Salt made his fortune in the Bradford textile industry, manufacturing fine woollen fabrics. Determined to escape the polluted and overcrowded town centre for greener pastures, he made a bold decision to relocate his business and his employees. Local architects, Henry Lockwood and Richard Mawson, were employed to plan a new community where Salt's workforce would be healthier, happier and more productive. Work began in 1851 and continued until 1876. 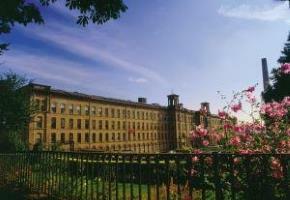 Salts Mill was the first building to be complete in 1853. Lockwood and Mawson designed the entire village in a classical style, inspired by the Italian Renaissance. Their finest work was Saltaire United Reformed Church now a Grade 1 listed building. Housing was provided of the highest quality. Each had a water supply, gas lighting, an outdoor privy, separate living and cooking spaces and several bedrooms. This compared favourably with the typical worker's cottage. Salt was also one of greatest Victorian philanthropists. He donated liberally to good causes locally and nationally. Almshouses were provided rent-free for the elderly and sick in Saltaire. They came with a pension, forty years before the first state pensions in the United Kingdom. By the 1980s the British textile industry was in steep decline. Production was scaled back and Salts Mill was finally closed in 1986. To the rescue came another brilliant entrepreneur, Jonathan Silver who bought the Mill and within months opened a gallery exhibiting the work of Bradford-born artist David Hockney. During the 1990s more of the mill was brought back into use and filled with business, shops and the famous Salts Diner. Saltaire was inscribed on the UNESCO World Heritage List in 2001. It was recognised for its international influence on town planning and as one of the earliest, largest and best preserved nineteenth century ‘model villages' anywhere in the world. Further changes have taken place recently. 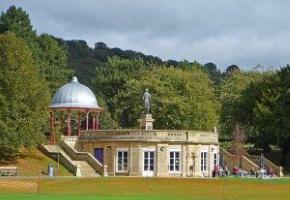 With extensive investment from the Heritage Lottery Fund and Bradford Council, Roberts Park has been restored. A new bandstand and children's play area have been added and the buildings and landscape repaired and revitalised.